The ‘COMPLETE PV SYSTEM’ – supplied as a ‘TURNKEY’ solution, Soleil PS are available from 608 – 4,024 kW and delivered complete with; Integrated Grid Tie Utility Scale Inverter, MV transformer and Ancillary DC Equipment all equipped for ready connection into individual site infrastructures facilitating substantially reduced connections and site preparation. Output voltages with intergral onboard medium voltage transformers (Vac): 6-10-15-20-36kV (other values on request). The ‘COMPLETE PV SYSTEM (Power Station)’ – supplied as a ‘TURNKEY’ solution, Soleil PS are available from 608 – 4,024 kW and delivered complete with; Integrated Grid Tie Utility Scale Inverter, MV transformer, and Ancillary DC Equipment all equipped for ready connection into individual site infrastructures facilitating substantially reduced connections and site preparation. The experience gained in the ﬁeld of renewable energies and attention to energy eﬃciency have guided the creation of SOLEIL Power Station, the new integrated solution dedicated to the direct connection to the medium voltage grid energy produced by large plants and solar parks. 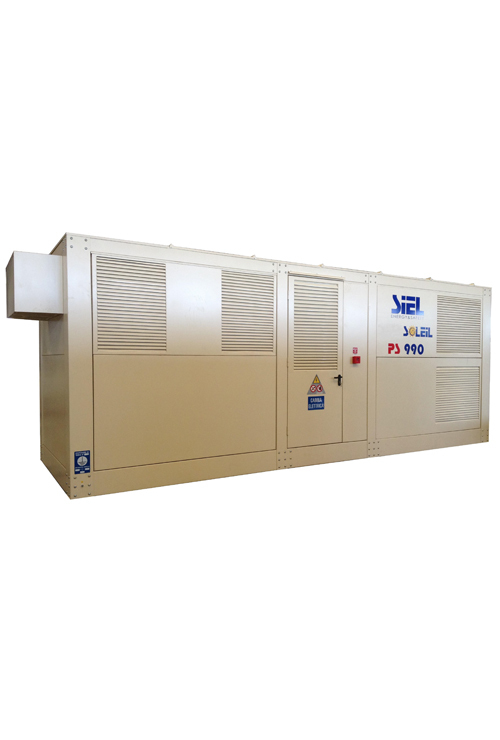 SOLEIL Power Station is a “plug & play” extremely compactable to serve a plant from 500kW to 2MW (other sizes on request). It consists of a structure in painted carbon steel and insulated. For photovoltaic capacity greater than 2MW, you can install multiple systems on the same system SOLEIL Power Station connected to each other on the MV side, forming a chain through a simple in-out connection from one container to another. SOLEIL Power Station is equipped with an integrated communications platform that allows monitoring of the entire system remotely.